We are happy to welcome you to enjoy our little paradise and our horses. More and more of our overseas clients kept asking if they can come and visit and do an intensive week or ten days of Humanship Horsemanship combined with travelling New Zealand. Your stay is organised to your individual wishes and needs, e.g. 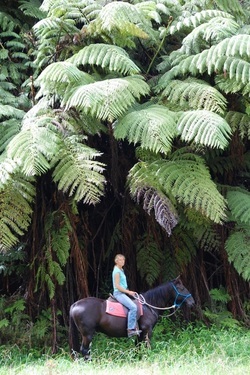 having a Horsemanship lesson in the morning and enjoying the beautiful bush & river from horseback in the afternoon. Or if you like, exploring what might have come up during the Humanship Horsemanship lesson on a deeper level in an Equine Assisted Learning (EAL, non-skill based) session while finishing the day of at one of the lovely beaches just around the corner. For more information feel free to contact us or visit www.northriver.co.nz for more details of the programmes we run at home in New Zealand.